Thank you operator. Thanks to everybody for joining in. From the World Tour to Fight Week, we are days away from a really, really big event. Floyd Mayweather versus Conor McGregor. I’m going to first introduce the participants on the call today. Of course we have the one and only Floyd Mayweather joined by Leonard Ellerbe, CEO of Mayweather Promotions, and Stephen Espinoza, Executive VP and General Manager of SHOWTIME Sports. At this time I’ll turn it over to Leonard Ellerbe to begin the call. Thank you, Kelly. I would like to thank everyone for joining this call today. We have a great event next Saturday and we’re excited. I just want to remind everyone on the call, this is the widest distributed pay-per-view ever. The fans can get this event however, whenever. We have a ton of content out there, and it’s available to fans wherever and however they want to get it. In addition to our normal, traditional methods that we distribute our platform on including via satellite, cable and telco providers, we also have a variety of digital options. You can order now. You can go to ShowtimePPV.com, or if get the Showtime PPV app, and it’s also available through Sony PlayStation, Xbox, Apple TV and Roku. So without further ado, I would like to bring on our partner Stephen Espinoza. Thanks, Leonard. We have indeed worked very hard to make this fight available as widely as possible using the maximum distribution and the maximum availability, including UFC platforms, UFC.TV, the movie theaters, closed circuit. There’s really no excuse for not watching this fight. This is an event that transcends sports. It’s captured the world’s attention. We’re seeing unprecedented interest in a number of different ways, surpassing what we never expected to surpass in the Mayweather-Pacquiao event. This is the final fight of a once-in-a-generation talent. It’s truly a once-in-a-lifetime event, the two best combat sport fighters in the world facing off like we’ve never seen them before. In Conor, we’ve got someone who’s as unpredictable as any opponent that Floyd has ever faced, both in and out of the ring, and it’s a challenge to Floyd on a whole new level. We’re supporting this matchup with three high-quality matchups from Mayweather Promotions, two world title fights headlined of course by one of my personal favorites as fan, Gervonta Davis, the US’s youngest world champion defending his title. We also have the light heavyweight world championship and an all-action opening fight as well. Last point. We are encouraging fans to buy early. There will be unprecedented activity on fight day. Very possible that we’re exceeding Mayweather-Pacquiao. We certainly are seeing activity which is far in excess of that. I know all of you guys have heard that before, but to give you some specifics, when we post things, we’re seeing things in the millions of views. When we do a Snapchat story and within 48 hours it’s at 4.5 to 5 million views, we know we have an unprecedented event. And in order to avoid the rush, we are reminding people to buy early as much as possible. Thank you, Stephen. So without further ado ladies and gentlemen, none other than the “money man” himself, Floyd Mayweather. Hey everybody. I want to say thanks for having me on this call and I want to thank you guys for writing about me for the last 21 years and keeping me relevant. Without the writers and the people that support this event and throughout my whole career I wouldn’t be where I’m at. So I just want to say, to every writer that’s on this phone, to every blogger that’s on this phone, I just want to say thank you. I appreciate you, Mayweather Promotions appreciates you, SHOWTIME appreciates you, CBS appreciates you, MGM Grand appreciates you, Swanson Communications appreciates you, my team and my family and my, everybody appreciates the stories and all the bloggers, the sports writers and everyone. We just want to say thank you and now we can get on with the questions. Do you spend any time thinking about how this is the last camp, this is going to be the last weigh-in or do you think back at all the to the start of your career? Actually I thought that Andre Berto was going to be the last weigh-in, I thought that was going to be the last training camp, I mean just honestly speaking I thought that was going to be my last everything. You just don’t ever know what can happen. We’re here with this big event. This is my last one, ladies and gentlemen. I gave my word to Al Haymon, I gave my word to my children, and one thing I don’t want to do is break that. I’m going to stick to my word. This will be my last fight. What was the really seminal moment for you that really turned the tide and got everyone’s attention for you? Was it more like aligning with Al Haymon and following the plan that both of you guys laid out? Al Haymon and I joined forced because when Al Haymon saw me he saw not just a fighter but a person with a sharp mind, very articulate, and very smart, and not just in the ring but outside the ring and he knew that we could be a powerful force together. Now once again, when I fought Diego Corrales, I did good numbers. When I fought Angel Manfredy, I did good numbers. And the list before I even got to Haymon, I did good numbers. But me and Haymon together came together and had a game plan, whereas when I was dealing with people in the past, nobody ever really had game plan. I had a game plan. We already had a game plan. Me and Leonard both had a game plan, but it was missing a piece. So when we all came together as one, that’s when I came up with a game plan and they started putting everything into play. Also after this fight, how do you think you’re going to spend your life? I know you got Mayweather Promotions, but what else are you going to be involved in and what are you going to be doing as the days pass? My real estate portfolio is truly amazing. The real estate, that’s very, very huge. That’s a huge part of my life. My children are going to college so that’s going to take up a lot of my time because education is extremely important in my home. I want my kids to do something that I wasn’t able to do. I want them to be able to go college, and then the businesses that I leave for them, I want them to be able to take those businesses and take them to the next level. If I took a business and made 100 million, I want them to take it to the next level to make 400 or 500 million. So it’s all about giving back. I’ve built different businesses and got businesses started so my children’s children can takeover someday. I think a critical turning point in Floyd’s career was buying himself out of the Top Rank contract. That is going out on a limb, paying $750,000 with no guarantees on what’s going to happen on the other side of that. Without the courage to make that move, without the foresight to make that move, none of the rest of this possible. It’s easy to sit back and forget that it all starts with taking risk. 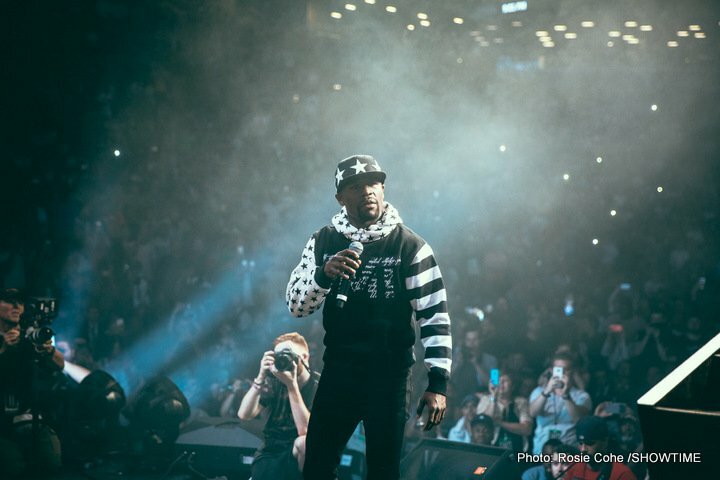 No one has this level of success without taking a risk, and that’s one very tangible point where Floyd put his money where his mouth is, took the risk and was able to reap the rewards. What weight class do you believe that you were at your absolute best in and why? Well I think it all depends on certain fights. You look at the Diego Corrales fight. There was a lot of people talking about that one. And at 135, the fight against Phillip Ndou. People like to talk about that as one of their favorite fights. At 140 they like to talk about the fight against Arturo Gatti because I really wasn’t at 140 at that moment. And then at 147, they like to talk about the fight against Ricky Hatton. And at 154 they say it was a hell of a fight between me and Miguel Cotto. Then they also talk about how I was dominant at 154 against Canelo. I guess different days go different ways when you go out there and compete. I don’t want to judge myself, I just want to say that, different days I feel different ways. It all depends on how I feel when I go out there. Because some days I don’t feel up to par but I still go out there and I put on a hell of a show. Some days I go out there and feel great and the show is really not that good. For which fight would you say that this is the best Floyd Mayweather there’s ever been? I can’t really say. I don’t even watch the fights because it’s hard for me to watch. It could be any of my top fights that people say that they love the most, but I say I could’ve been better. I could have done that better because I’m critical of myself and I feel like there’s never been enough. When I go out there and compete, I could’ve done something better, I could’ve been better. So, it’s good to not even watch it. My older son, both my boys, not my youngest daughter, but my three oldest, they love to going on YouTube and watching it. Was there one fight in your mind that, even though you got the victory, that maybe you were disappointed in your performance? There have been a few fights where I probably said yes, I won, but that wasn’t my best. But I come back and I look better the next time. I look at lot better the next time. What do you expect the atmosphere and the level of crown support to be like on the night and how do you think that will be divided between yourself and him? That really doesn’t have anything to do with the crowd. It has something to do with the two competitors. It could be pro-McGregor, it could be pro-Mayweather. It’s all about excitement, it’s all about giving everybody excitement, my fans as well as his fans, that’s what it really is about. I want to touch on the subject so everybody knows, that me and Ricky Hatton actually fought at 147, but we fought in 10 ounce gloves. So, I was going to make sure everybody on the phone is aware when me and Ricky Hatton fought against each other, we wore 10 ounce gloves and was at 147 pounds. How often have you used the 8 ounce gloves and how often the 10 ounce gloves? Well, from 147 all the way down the boxing weights, you fight in 8 ounce gloves. From 154 that all the way to heavyweight, you fight in 10 ounce gloves. At one time boxing there was a lot of trauma and head injuries, so they brought 10 ounce gloves in for the fights to wear at 147. But then they went back. The guess that they weren’t getting the blood, sweat and tears they were expecting to get, so they had to go back to the guys wearing 8 ounce gloves at 147 all the way down. I was just wondering how closely that you followed what happened this weekend in Charlottesville with the protest and if you have any thoughts on it and the president’s reaction to it? I’ve honestly been extremely, extremely busy, so I haven’t even been on social media or been watching TV. I’ve been extremely busy training, working out and just spending time a lot of time with my daughter. But I’ve seen some things, and what’s going down in Charlottesville, it’s not cool. It’s not cool at all. I always talk about the world needs to be a more positive place. I didn’t really hear what the president said. I’ve been so focused on this event, it’s so huge. I was curious if you’ve seen the video that was released of Conor’s sparing session with Paulie Malignaggi and what you thought of that, even though it was only about 20 seconds. I had a chance to see it. And my thought is that I think it was really interesting, but with a lot of rabbit punching; a lot of illegal rabbit punching behind the head. A lot of grappling, a lot of wrestling, a lot of illegal shots. That’s just my honest opinion. I’m pretty sure the referee is going to be fair on both sides. I just want a good solid fight. Did you believe he got the knockdown on Paulie based on the video we saw? Some some may call it a knockdown; some may not call it a knockdown. But at the end of the day, it only counts once you get under the lights, that’s just in a gym. We sit here judging Paulie, a guy that’s been retired and just commentating and traveling the world and not going to the gym at all, instead of going in there with a guy who is just working out, an athlete period, just working out every day. I wanted to get your assessment of the referee and do you think he will play a part in the fight at all? I truly believe the ref is going to do his job. The referee’s job is to make sure that he’s keeping the bout clean. I want to have a good fight. Like I said on numerous occasions going up to this fight, I’m coming straight ahead. So, he doesn’t have anything to worry about. I look forward to following the rules of boxing. I’m pretty sure he looks forward to following the rules of boxing. He had Joe Cortez in his training camp which is a great thing. Even though he had Joe Cortez in his training camp, I still see him doing extremely dirty things. But my job is not to worry about the referee, my job is to go out there and fight and let the referee do his job. Let me add on to that. We’re very pleased with the selection of all the officials that we have for the entire card for August the 26th, with the referees included. The Nevada State Athletic Commission is the best commission out there, and they have the best officials in place and we’re very happy. Obviously you’ve fought in 8 ounce gloves, but do you think that favors you or Conor more the fact that they dropped the gloves to 8 ounces? Or how do you think that really affects the outcome of this fight? I’m not really worried about the outcome. I’m worried more about excitement. Conor said he’s used to fighting in 4 ounce gloves. If you go to my social media page, you’ll see where I put out the extra work. I want to make him feel comfortable as possible. I’m not going to have any excuses. I don’t want him to have any excuses. How has the process of training and recovery changed as you’ve aged? It’s not really the same. I think with age comes wisdom. It’s about just knowing your body. When I was younger and I talked about this Media Day, you’re young, it’s fight, fight, fight; never let the body recoup or rejuvenate. Whereas I’m older now, so resting is very, very, very important. I work extremely hard still at the age of 40, but I’m letting the body rest a lot more. And that’s why, you guys saw on All Acces I was taking time. I have a whole team that helps me keep my body intact and in order. How much do you really believe what you said about losing a step and how much are you saying that to generate interest in the fight? Well I’m just being honest. I don’t think that I’m the same Floyd Mayweather that I was ten years ago; I’m not even the same Floyd Mayweather that I was five or two years ago. But I still said that I still have a high IQ in that ring. And I said experience-wise, it leans towards me, just period. Most times when I go out there and compete against any fighter, experience will always lean towards me becauseI’ve been in the ring and been at such a high level for so long. How do you feel that press and fans treat you and McGregor differently and do you believe that race plays any role in that? I’m not even going to really touch on that anymore; I spoke on that. I’m going to leave it where I left that. You know, I spoke about that before. I’m going to let Leonard Ellerbe touch on that subject. The things that he was saying about the back-and-forth banter, it’s trash talk. Floyd’s focus is fighting next week and putting on a great performance for all the fans across the world. That’s where we are at. There are double standards out there. But that goes on with anything. There is a high awareness out there in the public, there’s a lot of things that go on. Floyd’s focus is next Saturday and going out there and putting on an electrifying performance in front of his fans; that’s where we’re at. Do you see anything of you in McGregor when you’ve spoken and been a few feet away from each other? I don’t think there’s any fighter period that’s in combat sports right now that hasn’t looked at a Floyd Mayweather video or studied a Floyd Mayweather fight. At least I don’t think so because I think there’s like a Mayweather era and I will still look down in my era. When a person has been so dominant in his era, I think other fighters are going to pay attention. The main fighters are going to pay attention because they want to be at that same level and they want to do the same thing. They want to dominate with ease. Do you see anything in the past between you and him — when you’ve kind of interacted — any similarities at all? Not really. Of course I’m huge in boxing, but I’m huge in MMA also. I’m huge in both in the sense that my name is huge in MMA. I made a crazy name in the sport of boxing, but it’s crazy that I’ve been working so hard throughout the years that I ended up having a big name in MMA also. So even though I never competed in MMA, I’m still a big name in MMA. Given the point you are both on now, who is taking the bigger risk here? I truly believe I’m taking the bigger risk. But it’s a big reward for both. I have the 49-0 record. When a fighter has lost before, if he loses again, they say, “Oh, it’s nothing. He’s lost before.” But when a fighter has been dominating for 20-some years — never lost — everything is on the line; my legacy, my boxing record — everything is on the line. have you stopped at any point and kind of thought, “wow, there is a whole lifetime’s work here that I am putting out there.” Or do you kind of not let it enter your mind? I just try and really focus on being positive. I just worry about going out there and doing what I do best. I try not to think about losing or taking an L, that’s really not my focus. Every day I tell myself I’m a winner. I was born to be a winner at life. Not just in the ring, but I was born to be a winner. So whatever I do, I try to give it 100% and I try to push my limit. But like Stephen said, it’s all about taking risk. I wouldn’t be where I’m at if I didn’t take risk. So I don’t mind putting the 49 and 0 record on the line. I don’t mind putting everything on the line, for this fight. I feel like it’s worth it. How important it is for you to get the 50th victory of your career and give you one more than the Rocky Marciano record? I don’t focus on other fighters. But I’m appreciative for every fighter that paved the way for me to be where I’m at. I always talk about how I appreciate the legendary fighters. My focus is to go out there and give the fans an exciting fight even though I know this is number 50 and we’re constantly talking about Rocky Marciano. I just always like to let the fans and the people know Rocky Marciano is a legend. Rocky Marciano did it his way, and I would just like to try to do it the Mayweather way. Okay, thanks to everybody for joining us. Any last closing comments, Floyd, and we will wrap this up. I just want to say thank you to everybody. I want to say thank you Leonard, I want to thank SHOWTIME, I want to thank CBS. I want to thank Kelly Swanson, I have to thank Al Haymon. And I want to thank everybody that called in — all the writers, all the bloggers, everyone from the MMA world, everybody from the boxing world, everybody from the sports world. I just really want to say thank you. Me and my team, we all appreciate you guys. Talk to you later.